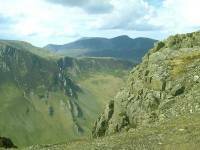 The easiest ascent of Dale Head is by its south ridge, from Honister Pass. There is some 1300ft of ascent and it takes about 45 minutes. 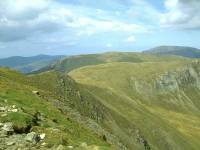 Many fellwalkers regard Dale Head as the easiest of the bigger Lakeland fells; it's probably the hill with the greatest reward to effort ratio, in as far as these things can be measured at all. "Easy", of course, is a relative term. 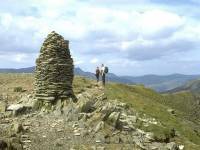 The 2473 ft summit of Dale Head, and a cairn that has been rebuilt several times. 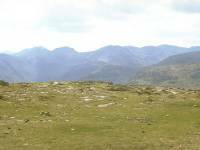 The westward view from the summit towards Hindscarth, with Robinson beyond and Grasmoor in the distance to the right. 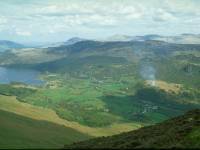 Buttermere lies in the dip to the left; Gavel Fell and Blake Fell appear on the skyline beyond. Hindscarth Crags form the east wall of Scope End, Hindscarth's north ridge. 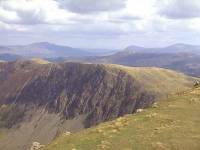 Grasmoor, Eel Crag, Sail and Grizedale Pike ring the skyline. 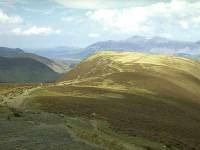 The end-on view of the upper Newlands valley shows why Dale Head is so named. A NNE view from the summit looks along the ridge I will be following; High Spy (near at hand, to the right) merges into Maiden Moor (further north) and eventually Catbells (not seen). 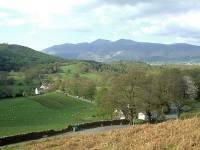 Skiddaw and Blencathra dominate the skyline. High Spy seen from Dale Head. 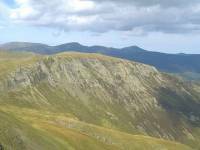 Blencathra is 10 miles away on the skyline to the left, while Clough Head and Great Dodd appear to the right. 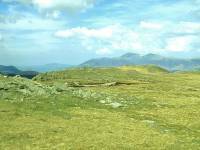 The Central Fells ridge is in the middle distance. 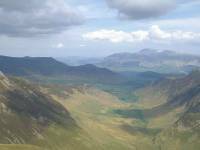 Bowfell, Esk Pike and the Scafells seen in this southeast view from Dale Head's summit. 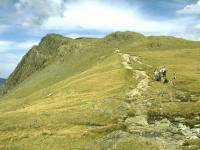 High Stile is the hump to the right. 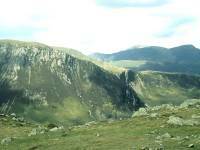 High Crag is its outlier in the centre of shot. The mass of Pillar rises to the left, beyond Ennerdale. 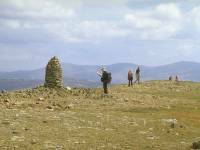 Another view of Dale Head's summit cairn and a cluster of visitors. 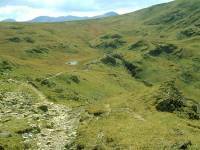 The initial stage of the descent path eastwards to Dalehead Tarn. 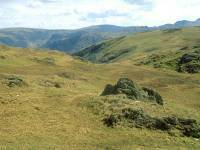 High Scawdel, Dale Head's southeastern shoulder, is seen here. 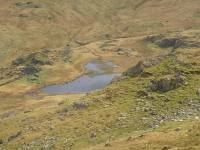 Dalehead Tarn lies in the shallow col before High Scawdel, about 900ft below Dale Head's summit. 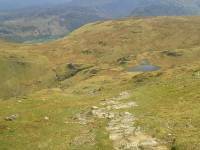 It's a long stony descent to Dalehead Tarn but you can tackle the grassy slopes rather than the made path if you prefer. The tarn seems to take forever to reach. 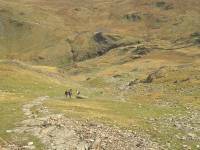 About halfway down to the tarn. The gradient is fairly uniform. 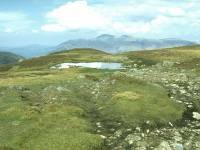 Nearly there; the highest reaches of Newlands beck above the tarn. About 100 ft above the tarn. 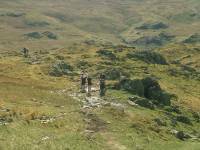 Standing at a height of just over 1700ft, it is a popular refreshment stop for walkers during the day and an equally popular wild campsite at night. 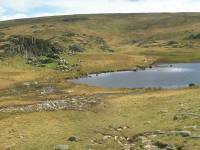 The environs of Dalehead Tarn. 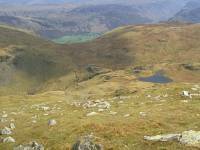 Looking at the bulk of Dale Head from the little crag just east of the tarn. Newlands Beck is forded just below the tarn, beyond which it forms this tiny but picturesque gorge. This locality is known as Rigg Head. From Rigg Head the path rises from the col towards High Spy. There's some 550ft of reascent. A retrospective view of High Spy's south ridge at about 1900ft. 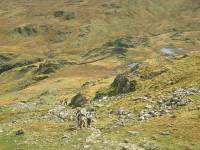 Walkers ascending High Spy, at around 2000ft. 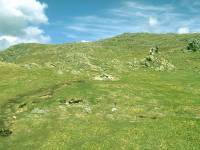 High Spy's summit is a fairly extensive plateau that falls gently away to the east but rather more dramatically to the west. 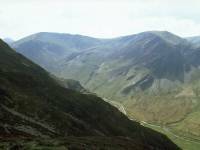 Dale Head, seen across Newlands to the southwest. 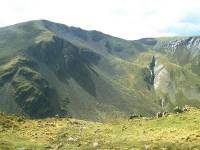 The Tongue Gill ravine is very prominent. 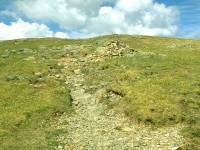 The path wanders along the summit plateau. 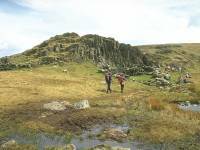 The summit at last, perched high on the western edge of the plateau at a height of 2143ft. 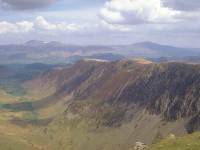 Scope End seen across the Newlands valley, with Grasmoor, Wandope and Eel Crag looming beyond. 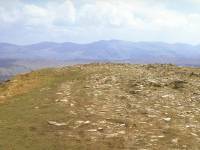 The summit plateau of High Spy continues northwards from the summit cairn for another half mile. 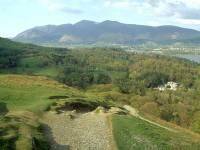 Skiddaw comes into view. 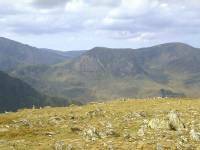 The summit plateau narrows and eventually falls away over Blea Crag. 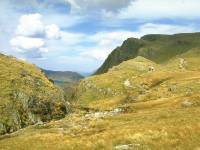 I've deliberately wandered off the path to track eastwards for a look down the slopes above Borrowdale. 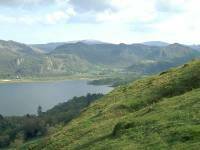 Bleaberry Fell stands opposite; beyond it, across the dip of the unseen Thirlmere, are Clough Head and the Dodds. Some crags on the western flanks enliven the scene. 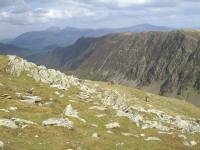 The steep sides of Scope End rise on the other side of the Newlands valley, with Grasmoor, Wandope and Eel Crags beyond. 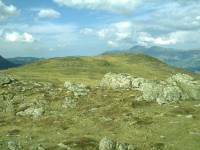 The northern end of the summit plateau. Derwentwater comes into view. Looking directly along the ridge from the same point. 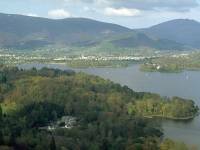 Skiddaw appears in the distance to the right of the unseen Bassenthwaite. This little tarn doesn't even figure on the map. 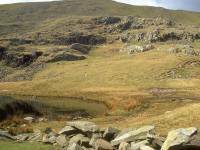 Maiden Moor (1887ft) is another fell with a big plateau-like summit. I waited nearly half an hour for a break in the clouds to grab this shot. Looking back along Newlands from the descent from High Spy to the Maiden Moor col. It was galling to see the sun shining on the valleys to either side. 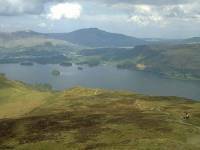 Despite another long wait Maiden Moor remained cloud covered and eventually I gave up and walked on to Catbells. A brief sunny interval enabled me to grab this shot from the vicinity of Hause Gate (the col between Maiden Moor and Catbells). ...seen from Hause Gate. Nearer to is the shapely topknott of Catbells. 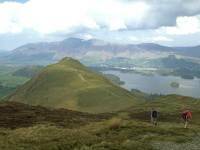 Catbells, elevation 1481ft, is without doubt the most popular fell in the Lakes. 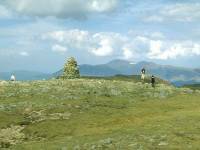 On fine days the summit sees hundreds of visitors. 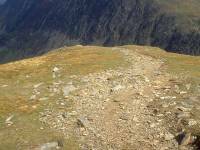 It's not a straightforward climb, though; its rocky topknott cannot be ascended with any degree of dignity and it's necessary to claw and clamber one's way to the top. Descents are equally tricky. 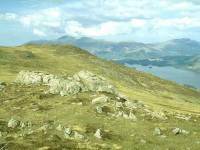 This is a view southwards along Derwentwater from the north ridge. 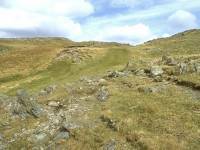 A good path below the scrambly bit drops quickly towards Hawse End. The path zigzags down the final shoulder of Catbells towards the road. Skelgill and the lower reaches of Newlands. Beyond the road, walkers in the know descend the little woodland path to the lakeshore to catch the Derwentwater ferry back to Keswick. The Lakeshore tearoom and its inquisitive birdlife provides a splendid finish to a day's fellwalk.